The Cincinnati Bearcats return to 5/3 Arena for a Monday night match up with the #23 Pittsburgh Panthers. The Panthers are coming off a very impressive showing Saturday afternoon, in which they took it to then undefeated Syracuse 82-72. The Bearcats are coming off a solid road win against Rutgers, which you can read about here. The Panthers and Bearcats are both 2-0 in Big East action, and this is a big game determining who gets the precious double byes in the Big East tournament. And it's never too early to start thinking about the NCAA tournament. These are a couple of teams that could be fighting for a berth, and beating the other head to head could be a determining factor. Jamie Dixon's team was thought to be in a down year after losing so much talent last year, but a 55 point second half against Syracuse has put them back in the limelight. How do they match up with a Cincinnati team that got themselves back in the limelight after a win against UConn? Let's find out after the jump. It doesn't take an exceptionally smart person to note that both team are excellent defensively. Pittsburgh has played a little softer schedule, but they have locked down the teams that they should have, and did, take care of. However, Pittsburgh has had struggles on the offensive end. They scored 47 in the infamous game against New Hampshire. These teams are incredibly similar. It's like looking in a mirror, only not. Yeah that was a Face Off reference, deal with it. The teams have a do everything player, Stephenson and Brad Wanamaker, and rebound the ball like hell offensively and don't let you rebound offensively. The Panthers play a very slow pace. Their double overtime game against Duquesne had 70 possessions. For comparison, the Cats double OT game against X had 84. This is going to be a slow down struggle in Cincinnati. For the Cats to win, Deonta Vaughn is going to have to keep it going. I expect him to. Larry Davis will probably get another start and be on Wanamaker, although it could be Stephenson. Davis will be on him or Ashton Gibbs. The Panthers made 10 3s against Syracuse and held the Cuse to 1. 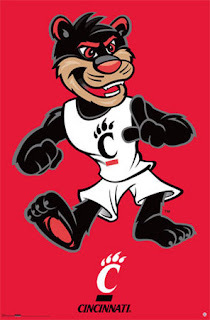 They can hold the Cats awful 3 point shooting to 1, but there is no way Cincinnati can allow 10. I don't think they will. The surprise star of the game for this one is Dion Dixon. I think he's going to have a nice game in leading the Bearcats to victory. A slight victory.